Canadian physician Dr. Andrew Moulden provided clear scientific evidence to prove that every dose of vaccine given to a child or an adult produces harm. The truth that he uncovered was rejected by the conventional medical system and the pharmaceutical industry. Nevertheless, his warning and his message to America remains as a solid legacy of the man who stood up against big pharma and their program to vaccinate every person on the Earth. 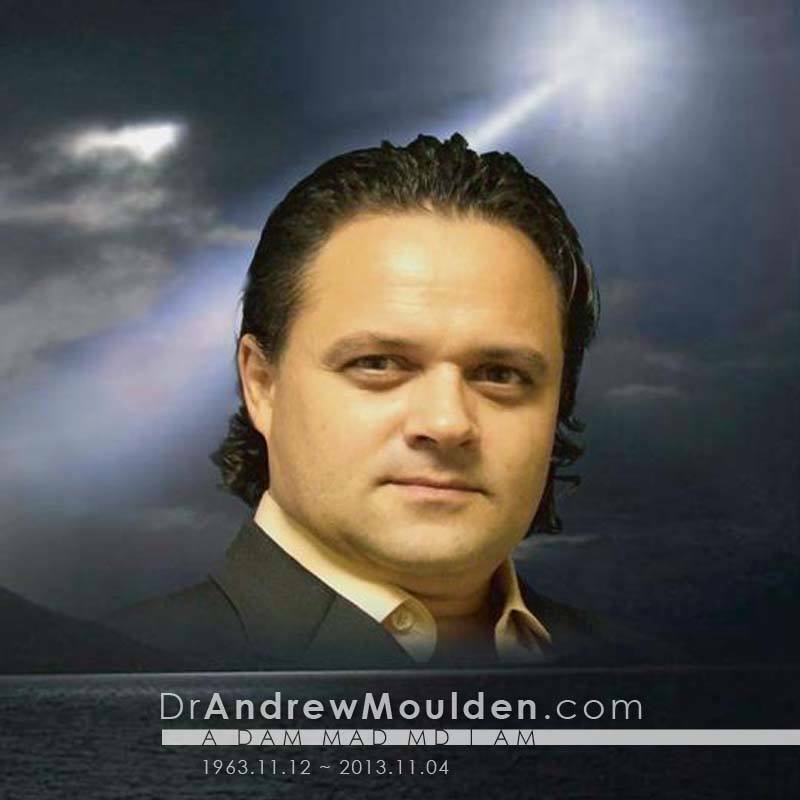 Dr. Moulden died unexpectedly in November of 2013 at age 49. Because of the strong opposition from big pharma concerning Dr. Moulden’s research, we became concerned that the name of this brilliant researcher and his life’s work had nearly been deleted from the internet. His reputation was being disparaged, and his message of warning and hope was being distorted and buried without a tombstone. Here is every therapy Dr. Moulden got to mention:Hyperbaric oxygen, acupuncture, shock therapy, and baking soda in distilled water. I currently have high-functioning autism and after drinking baking soda in distilled water, I was able to feel content, focusing became easier, and socializing became more intuitive. Also, baking soda has been used to cure many other health problems such as cancer and comas. It does not surprise me that it replenishes the negative charge of the body. Other treatments are yoga, breathing exercises, organic food, concentration practices, and plant minerals (90 For Life). His MASS FLO2 Life water is baking soda in distilled water. I drink half a teaspoon of baking soda in distilled water once a week. I currently have high-functioning autism and after I drank baking soda, I was able to feel content, focusing was easier, and socializing became more intuitive. Joel Lord, would come closest, Dr. Moulden was his mentor. Another brilliant human being/doctor with extensive knowledge speaking the truth but unfortunately taken off this earth prematurely. Great loss !!! Bloody awful to say the least. I have printed this as it will disappear at some stage!! I also follow a guy called JOEL LORD. He is brilliant also!! If Dr Moulden published any protocols, they would be found at www.pubmed.gov. Type "Moulden A" in the search engine. Dr. Moulden had the proof. He's dead now at a young age. Tesla invented a death ray. The Pentagon "procured" his papers and then said they were lost. Whistleblowers end up dead, imprisoned or exiled. I heard a talk about how there is a beam that can give a person a heart attack that goes through walls. Hmmm, let me just go sit in the corner with my tin foil hat. May truth fight the armies of Satan. May truth prevail. Save the children. Anyone who wants to send me jpegs of the sections on vaccination in modern-day medical school textbooks . . . I'll blog, in detail, using red markups on those jpegs, exactly how the Rothschild-funded Rockefeller medical school textbooks lied to future medical professionals on this subject. Be sure to send me jpegs of 1) all the book's pages on vaccination (grab the full pages, please) 2) all mentions of vaccination in the index 3) the book's front cover and 4) the page inside the front cover that has title, author(s), copyright date, etc. I need all those. Thanks, Jock Doubleday https://www.facebook.com/jockdoubleday.writer Author, "Into the Labyrinth: Discovering the Truth about Vaccination"
Thankyou! most informative and interesting article I have read on this issue. You are the bomb for creating this page. Send it to me in download form so I can keep it going. they are trying to erase it from the internet. But...good luck on that guys. the word is out and we're not stopping. Thank you for getting this printed up. Good info. No autopsy has been submitted regardless of how many people requested to see it. We were first told he suffered a heart attack. Then after we fought to get the truth surrounding his death, they changed their stance and said he suffered from bi polar and committed suicide. I call BULL! Does anyone know if there is someone who continued his legacy in terms of diagnostic testing based on Dr. Moulden's methodology (i.e eye symmetry, mouth measurements? General Practitioners should have to watch these videos. My general practitioner tried to tell me that mini-strokes don't happen. That they are either big strokes or not at all. I told him that I had 2 mini-strokes where I felt the blood swell up in one of my blood vessels until it burst. He told me it wasn't real. I am annoyed to find out he was misinforming me. I don't remember if it was after I took a vaccine or not though. I've had 3 of these mini-strokes that I remember now. No more vaccines for me, unless 100% forced. They are slaughtering us. I remember little deformities in my body that I experienced growing up. I wondered why my symmetry wasn't perfect, and why I couldn't help it. Now, I realize that this was caused in me from the vaccines that I took while growing up, and as an adult. I'm annoyed by this. This video is the truth. I can feel it in my body, and memory. Grr!!! I had come across Dr. Moulden years ago, and actually had a chance to talk to him briefly not understanding what was happening to him. I had purchased a book he was supposedly releasing soon but I never got it. I called his office staff and they gave me his number. I then learned how much he was harassed and that he had moved back to Canada. It became clear to me that he could never publish his book. I have all his videos and as difficult as they are to listen to (the loud background sounds) they are very educational. He was an expert witness in many trials defending families of the damage of vaccines. I had always wondered how he was doing and I appreciate your post so that I could find out. My prayers for him and to his family ~I believe after all I had learned about him that he was a brilliant scientist banned from telling the truth. Thank you for sending this information out on him.......the public needs to know the truth.